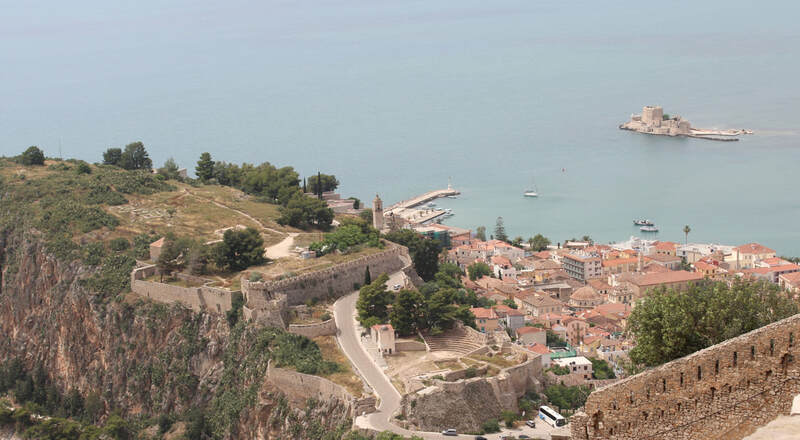 Our base for this tour in May 2018 was the port of Nafplio. This town is an absolute must see for the military history buff. 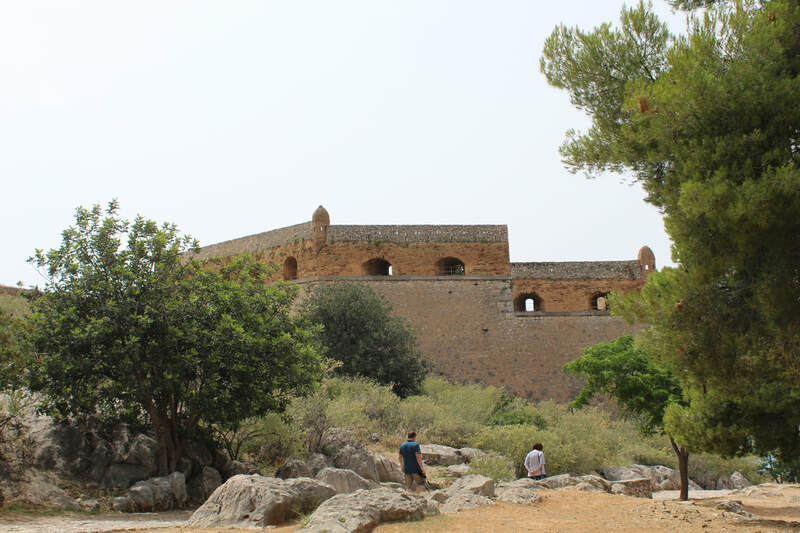 It has three castles and a very pretty town to keep the rest of the family entertained. 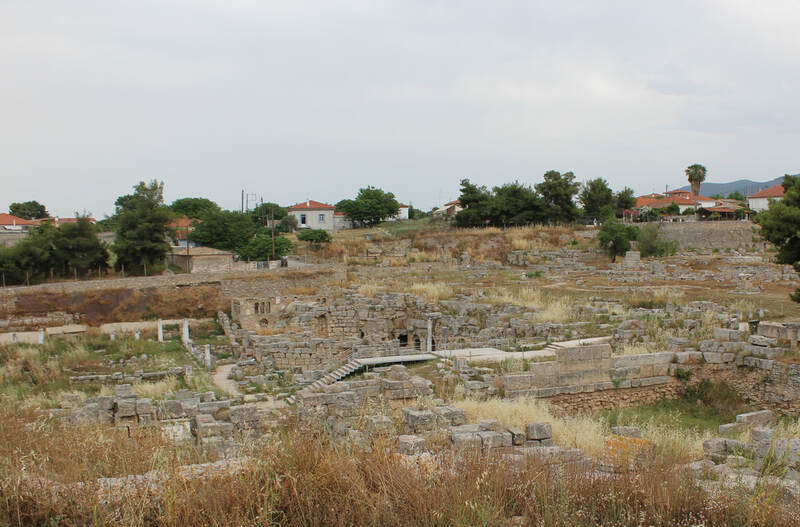 In ancient times the town was under the control of Argos as its main port, until the the Byzantines used it as a base for their anti-piracy operation. 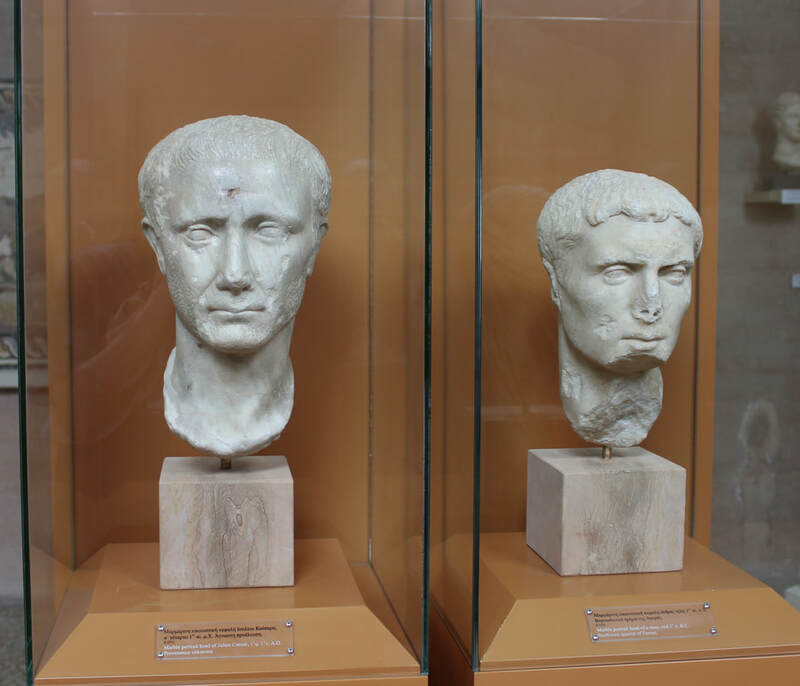 Then the Franks held it for around 180 years before giving way to the Venetians. In 1540 it fell to the Turks after a three year siege, although the Venetians briefly grabbed it back between 1686 and 1715. It was the first capital of independent Greece in 1827. 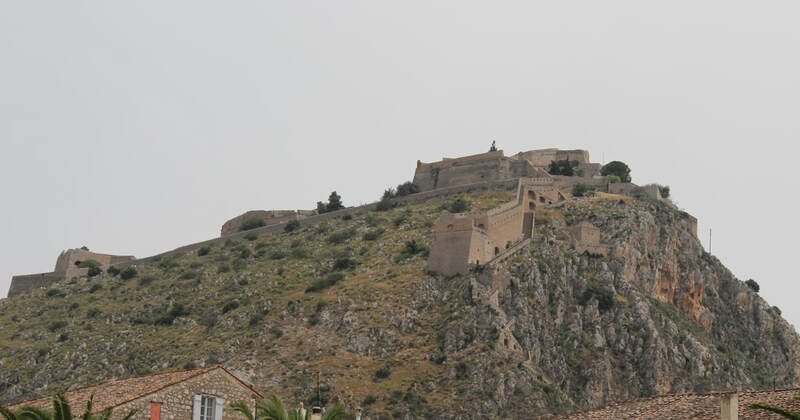 The main castle is the Palimidi which towers above the town. When you enter the main gate the Venetian lion immediately tells you who built it. It has five substantial bastions and is a huge site, so allocate a bit of time. If you are feeling fit there is a 999 step staircase from the town, but mere mortals like me drove up to the main gate on a surprisingly good road. 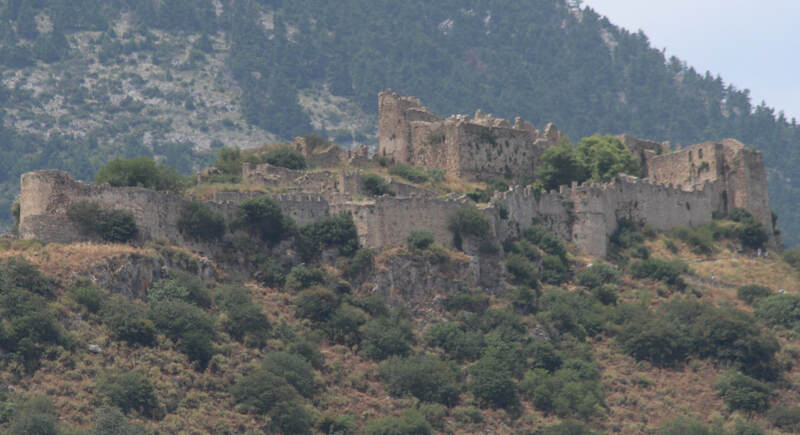 The Akronafplia castle defends the eastern approaches to the town. This was the Byzantine and then Frankish castle although improved by the Venetians. You can drive right through the site, or use a lift from the east end of the town. 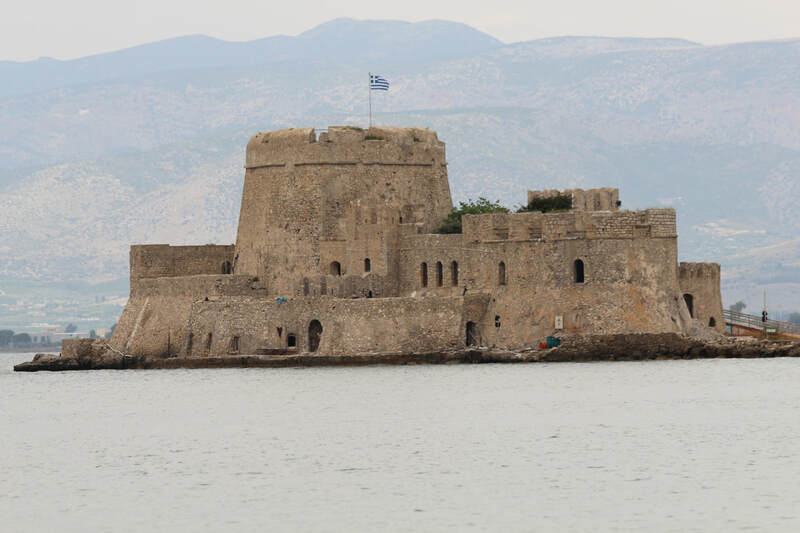 Finally, we have the small island fort of Bourtzi, which defends the harbour. It was built by the Venetians at the end of the 15th century. A boat trip will take you out to the castle, but it is currently being renovated - very slowly! 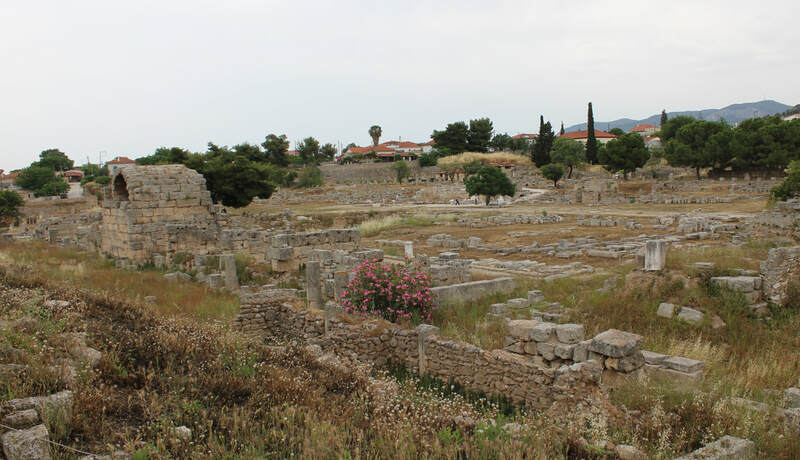 A short journey from Nafplio is Epidavros, a sanctuary of Asclepius, the God of medicine. 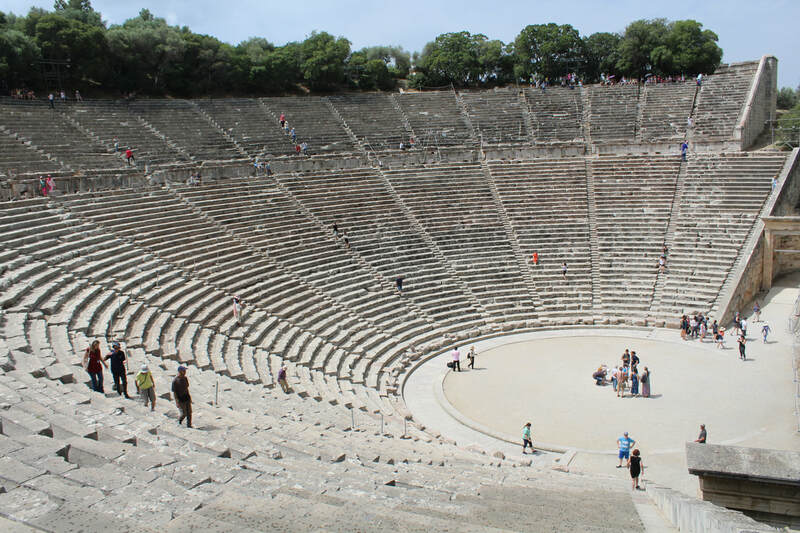 The star attraction is the 3rd century theatre, which can seat 14,000 people and has the most amazing acoustics. You can hear conversations on the top rows. Visibility, even the cheap seats would embarrass a few football stadiums I have been to. The sanctuary itself has extensive ruins of some unusual buildings for the period and covers a vast area. There is also a small museum. 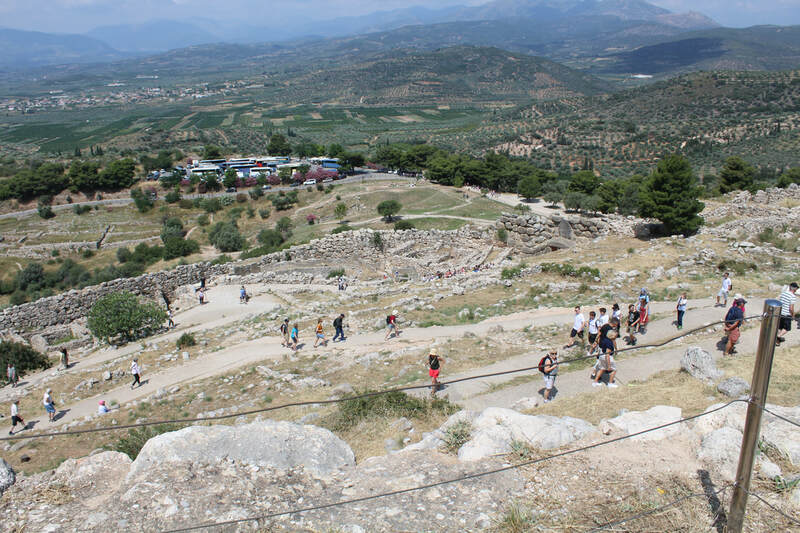 Ancient Mycenae is situated in the foothills of Mount Zara near Argos. 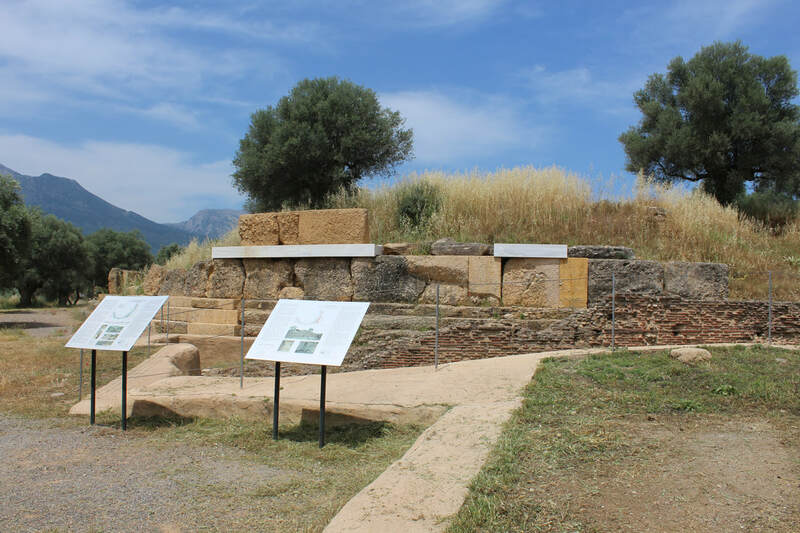 It was the capital of the mighty Mycenaean civilisation - one of the superpowers of the ancient world, along with the Minoans, Hittites and Egyptians. For wargamers, Greek history tends to start with the Hellenic age and the Persian and Pelopponese wars. However, the heroic age is worth another look. This was the age of Homer, the siege of Troy and the Odyssey. 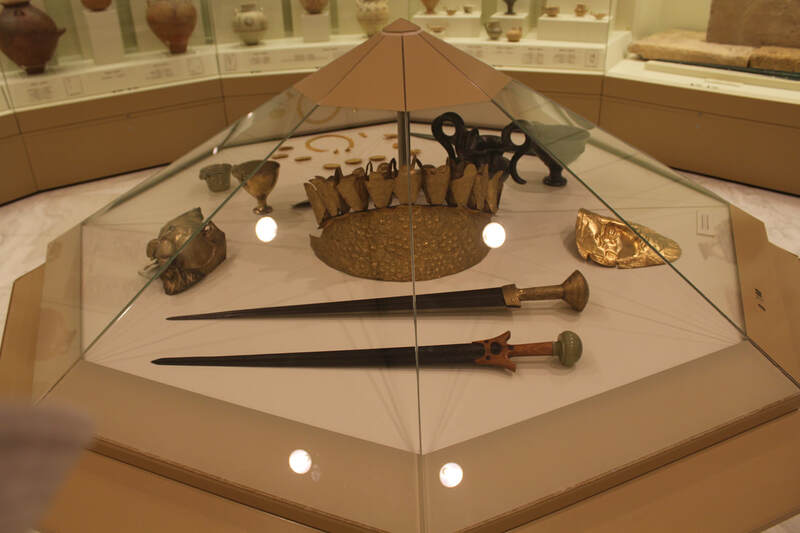 The Achaeans, as Homer called the Greeks, arrived in Greece between 2100 and 1900 BC, during the Bronze Age. 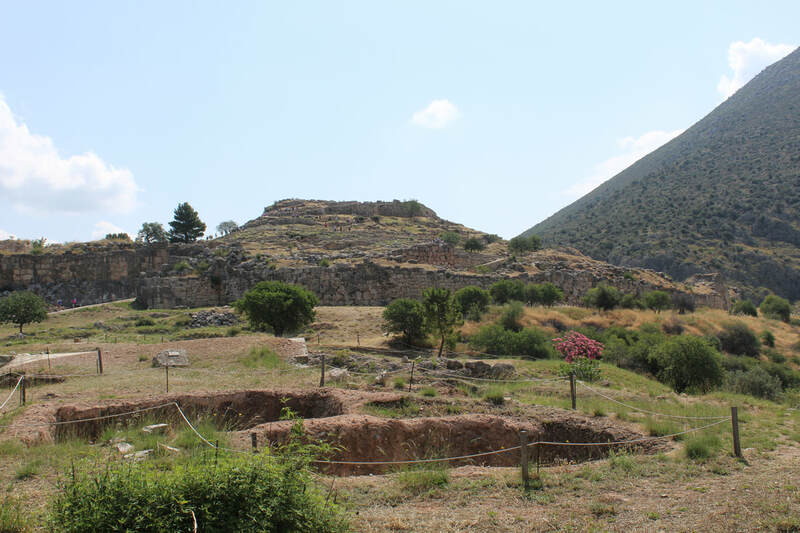 The fortifications at Mycenae date from around 1350 BC and uses stones so massive that the ancient Greeks believed Cyclops helped the founder, Perseus, to build it. 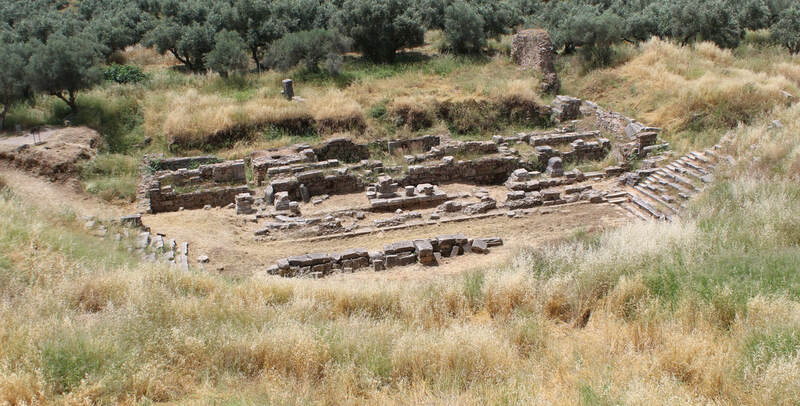 This was the palace of Agamemnon, who led the Greeks at the siege of Troy. For those who watched the recent TV series, he was the mega grumpy one! Mind you, having to sacrifice your daughter for some decent weather, would challenge most folk! The civilisation was destroyed around 1200 BC. It was thought by the Dorian invasions, but as with the Hittite and Egyptian civilisations, which collapsed at the same time, it is now thought that some other disaster was the cause. 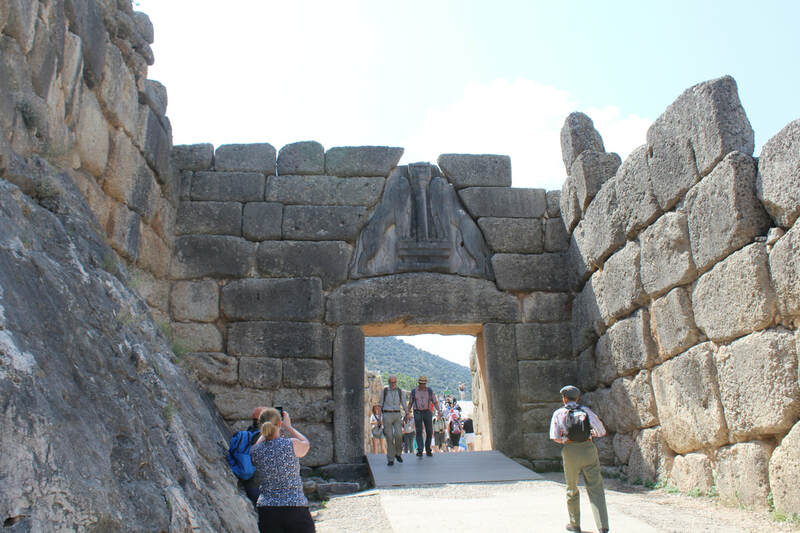 Mycenae is a remarkable site and well worth a visit. 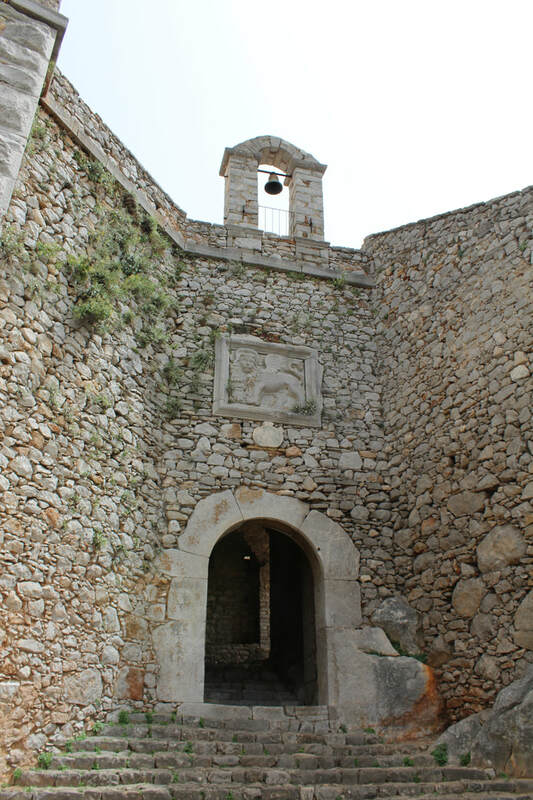 The entrance, with its Lion Gate is still largely intact as are the base walls. 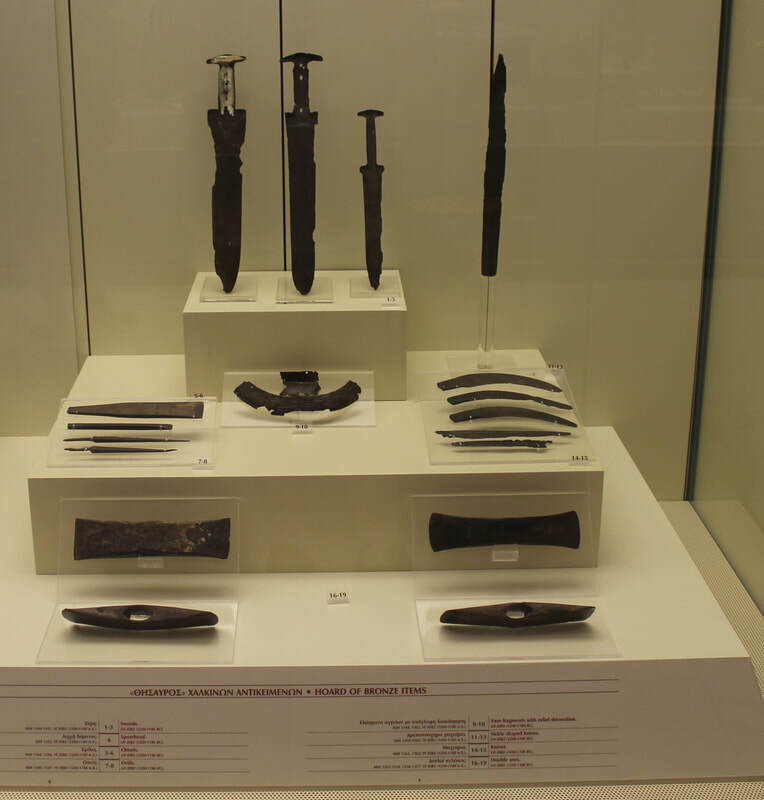 There is a very good museum on the site that explains the history and displays items excavated from the site, including some weaponry. 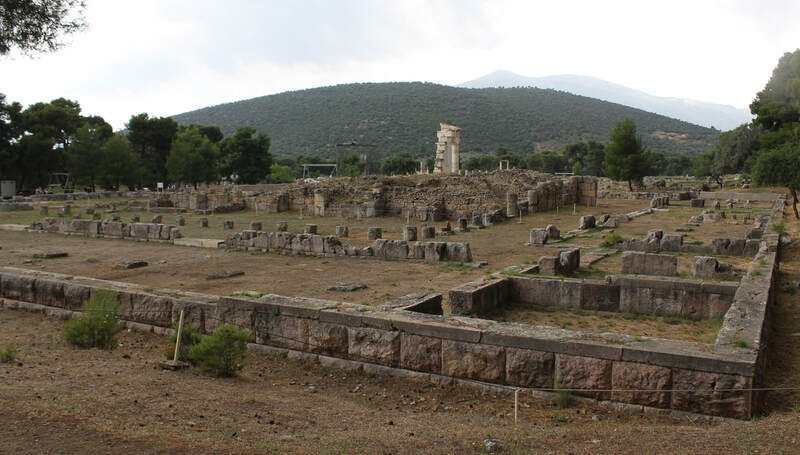 A similar and related site is Tiryns, on the road between Nafplio and Argos. Homer was impressed by the walls, which are still a sight worth seeing today. Like Mycenae, it is made up of massive stones, the largest weighing around 14 tons. 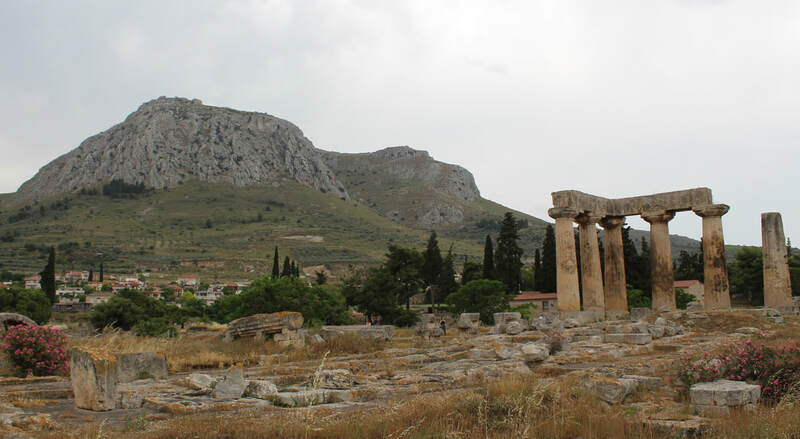 The ancient city of Corinth is just few miles south of the modern Corinth Canal and the narrow Isthmus that separates the Peloponnese from the rest of mainland Greece. The 6th century ancient city was one of the most powerful states in Greece, largely due to its strategic position and trading links. It had two ports on either side of the Isthmus and walls connected the city to these ports. 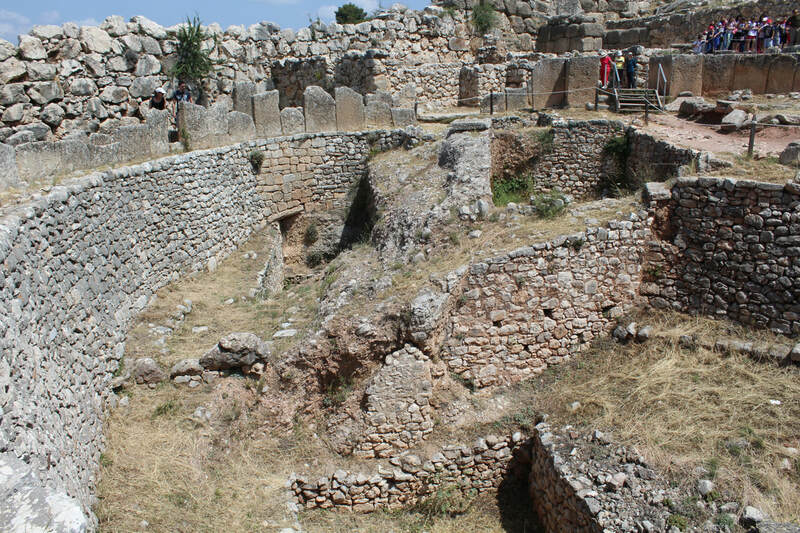 The ruins of the city have been excavated and offer a clear picture of the layout. 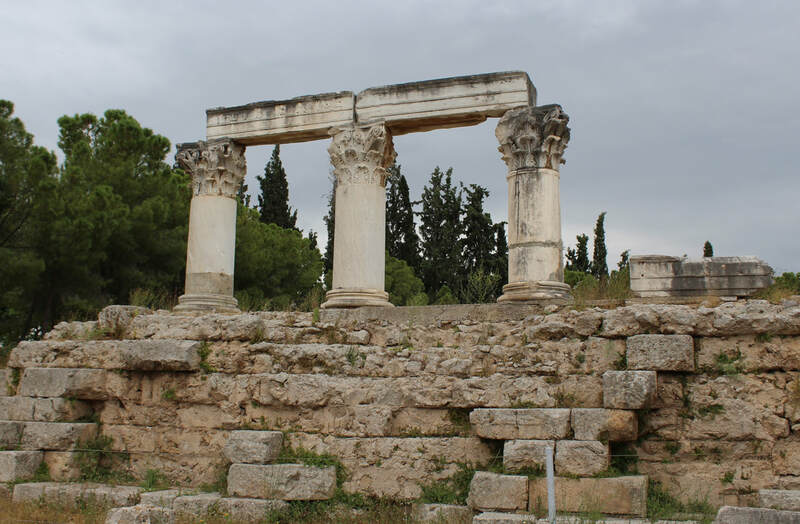 The columns of the Temple of Apollo, built in the 5th century is the most prominent ruin. 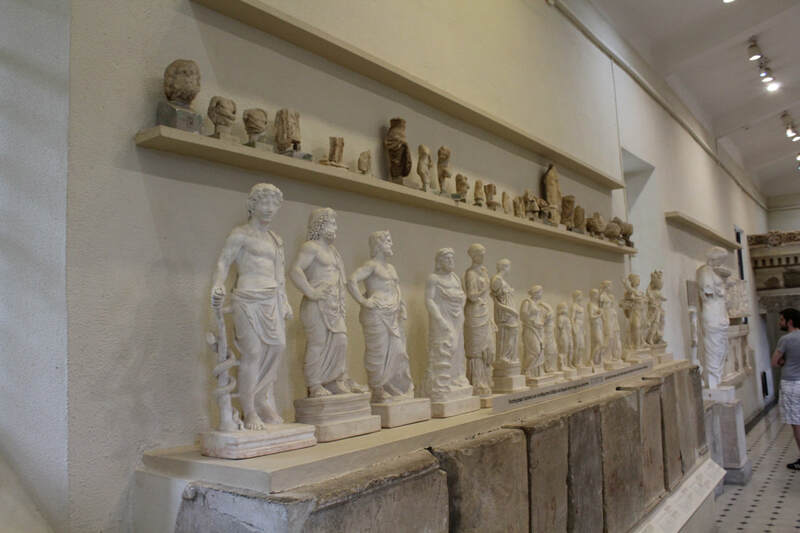 There is a medium sized museum on site that tells the history of Corinth and has statues and other items recovered from the excavations. The city held an astonishingly large population of over 300,000, plus at least as many slaves. They did enjoy themselves, paying homage to the goddess of love, Aphrodite. This meant rollicking with the Temple's prostitutes, male and female. St Paul famously tried to divert them to Christianity - a pretty tough pitch in the circumstances! 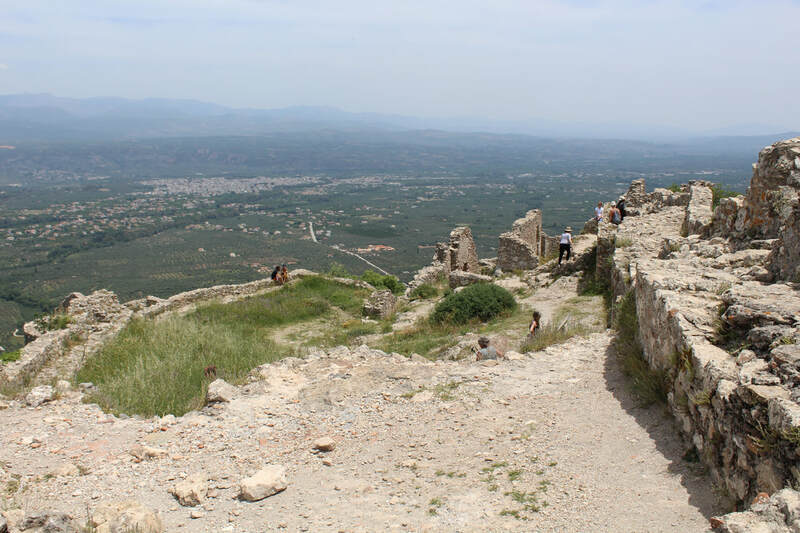 You can drive up to the star attraction, which is the citadel Acrocorinth. This is situated 575 metres above the city, with walls over 2,000 metres in length. The view is stunning and possibly one of the strongest fortresses I have visited. 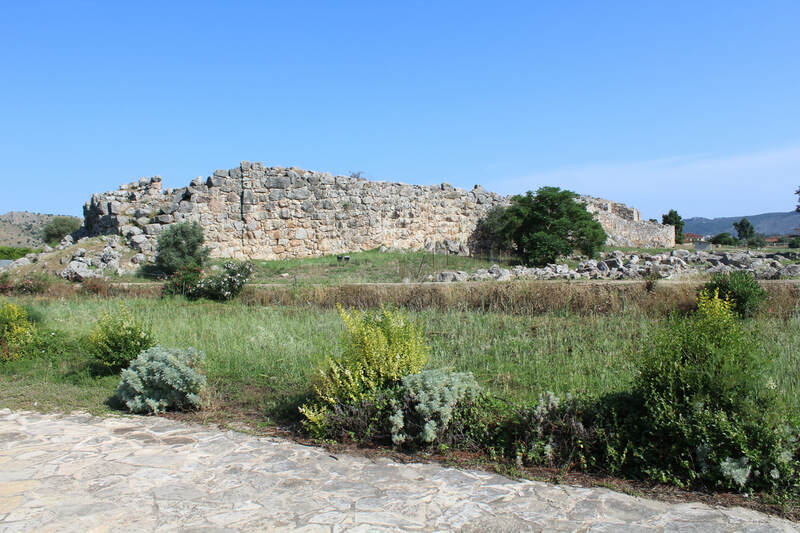 The ruins are well preserved and were built on by the Romans, Byzantines, Franks, Venetians and Turks. 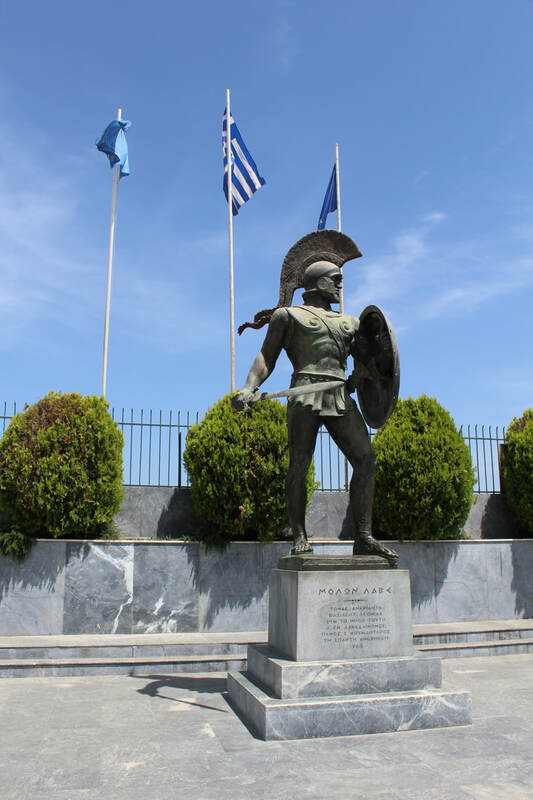 Modern Sparta isn't much of a destination, although they have put up a very fine statue of King Leonidas. There are a few remains on the Acropolis, but most are later Roman or Byzantine additions. Including a theatre and a church. 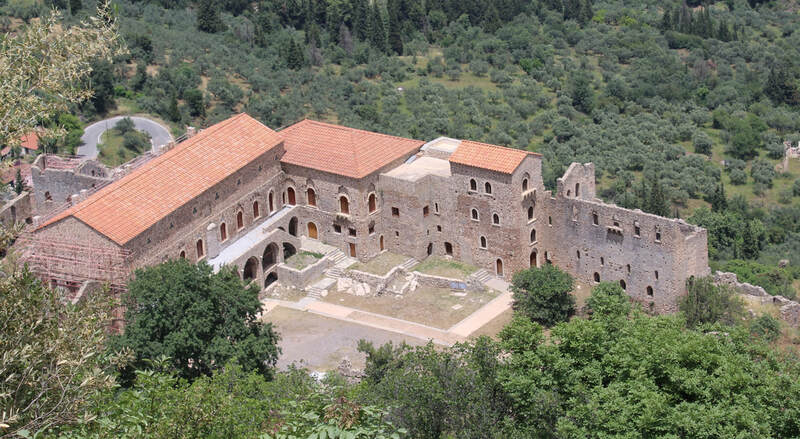 A few miles outside Sparta is the Byzantine hill town and Frankish castle at Mystras. The ever busy William of Villehardouin built the castle in 1249. It's a bit of a climb, even from the higher fortress gate, but worth the effort. 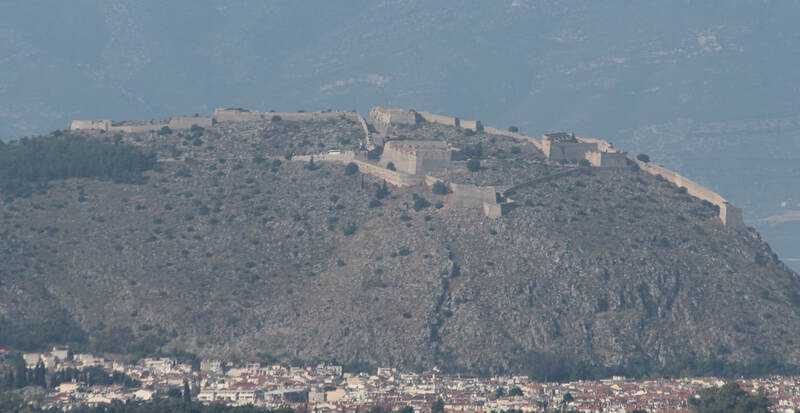 The castle keep is quite small, but you get a great view over the plain of Sparta. 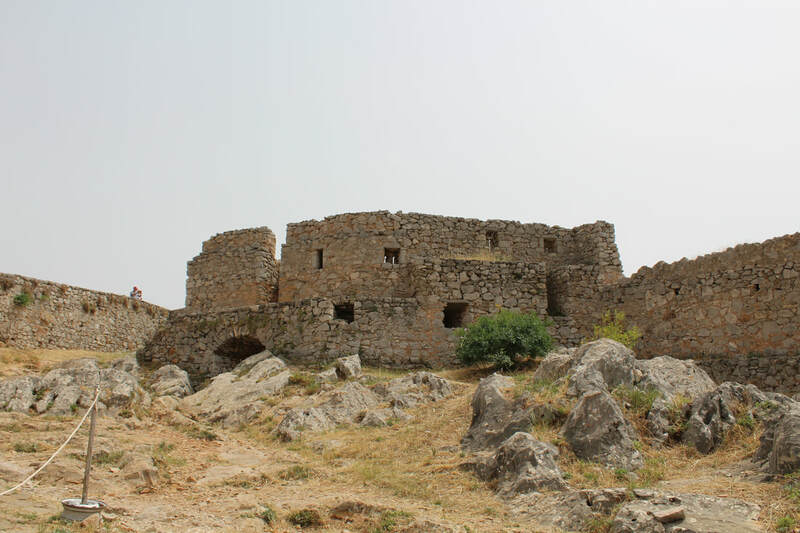 The Byzantine town dates from 1262 and is filled with monasteries, churches, mansions and palaces. Many are in good condition and others are being repaired. In the 14th century, members of the imperial family ruled from here and it became an important cultural centre.